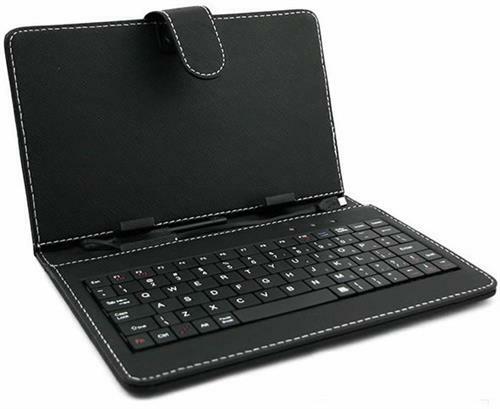 The XTouch Universal 10" Folio Cover with Micro-USB 80 Keys Keyboard transform any Android or Windows based Tablet PC up to 10. 1 Inch into a full-functioning desktop anywhere with a plug and play portable keyboard and protect your tablet pc from damage and make transportation easy. The Keyboard Section is Built in to the Hard Backed Case and has a Micro USB Cable Coming out of the Top to Connect to your Tablet, The Keyboard even has the Normal Lights for Caps Lock, Num Lock and Scroll Lock. The Top Section which Holds the Tablet is also Hard Backed and the PU Leather Covered Clips Securely Hold the Tablet in Place, Whilst Still Allowing Access to the Volume, Ports etc. • Comfortable, compact and stylish design. • Lightweight and Durable. Perfect for Work or Travel. • Multi Angle for view and folio stand design. • Great PU material, soft and comfortable, no peeling. • QWERTY keyboard, Real laptop style keys quiet keystrokes, comfortable to type. • It can protect your tablet PC from damage.